Does your space need something more? Is your electricity bill too high? Do you need creative lighting solutions? Finding the right ceiling fan can enhance the decor and overall function of your home! At Brilliant Electric we can help you install, upgrade, and maintain your choice of ceiling fan so you can start enjoying the benefits now. What are the benefits of a ceiling fan? Summer Breeze: Operating an air conditioner can be costly, but a ceiling fan cools a room efficiently by circulating air. So, you can keep cool and comfortable in the summer while saving money with a new ceiling fan. Backyard Comfort:Lounge days and get-togethers will be more comfortable and enjoyable in the summer heat with an aesthetically pleasing outdoor fan. 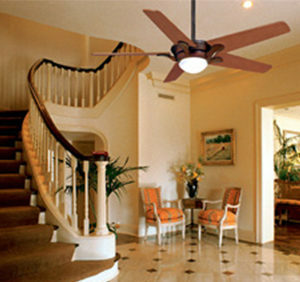 Lighting:Upgrading your lighting with a ceiling fan can make your space more functional and inviting in every season! Decor:An elegant ceiling fan can draw the eye and become the focal piece for any room. Ceiling fans come with a variety of styles and features to fit your home and your needs. Warm Winter: A ceiling fan can help you save money and energy in the winter, too! Heat rises and collects near your ceiling so using a fan in reverse makes use of the risen air by pushing it back down to warm your home.